Bristol-based woodworking apprentice, Liam Martin, 19, has been crowned the winner of W16’s very first woodworking and joinery competition, the W Challenge. 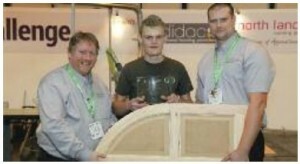 Run by training provider, Didac, the talented finalist was given four-days to follow a strict brief that would see him and three further students put their skills to the test to create a curved door panel. 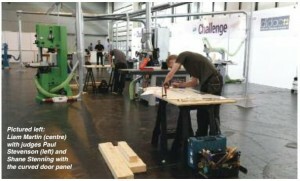 The brief, which was kept under wraps until the first day of the competition, was designed to challenge the students and get them to use a wide range of skills that they had learnt during their apprenticeship training. The judging process, which was headed by BWF’s Dave Campbell and Didac Supervisors, Paul Stevenson and Shane Stenning, looked at the whole manufacturing process and assessed the students throughout the competition. Shane explains, “Whilst the students understanding of the brief was a crucial factor, they were also marked on their house keeping skills. Safety, time management, conservation of timber and planning were all essential and marked accordingly. Liam’s prize was £500 worth of Felder vouchers and each finalist was given a personalised plaque to mark the occasion.